Outfitted with a buffet of food, a live DJ, gifts and small talk, the lawn was fit for a housewarming party. “I park my Bugatti over there,” the professor, clad in purple pants, Converse sneakers and a bowtie, says. But there was no Bugatti, and this was no ordinary housewarming party. It was a dumpster warming party. 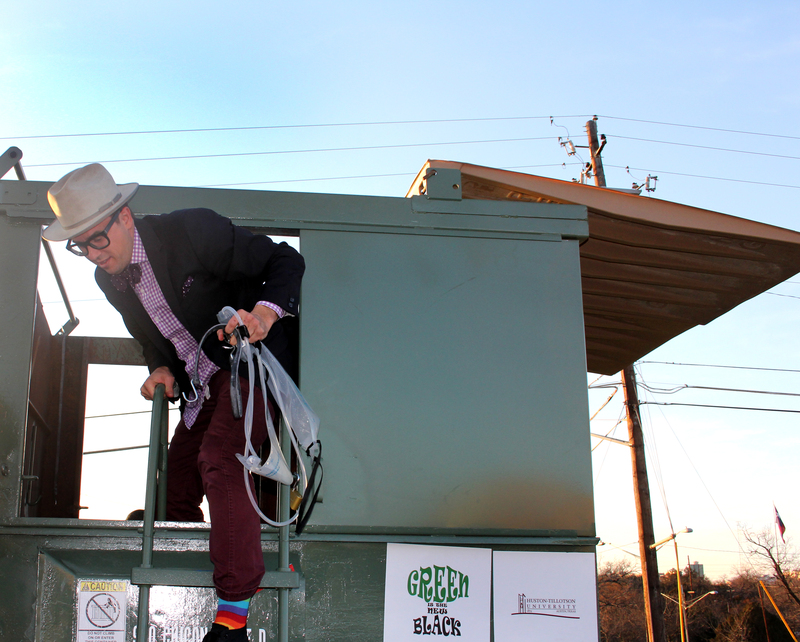 Huston-Tillotson University environmental science professor and dean Dr. Jeff Wilson, who frequently goes by Professor Dumpster, is conducting a sustainable living experiment dubbed “The Dumpster Project” wherein he will take up residence in a dumpster for a year. 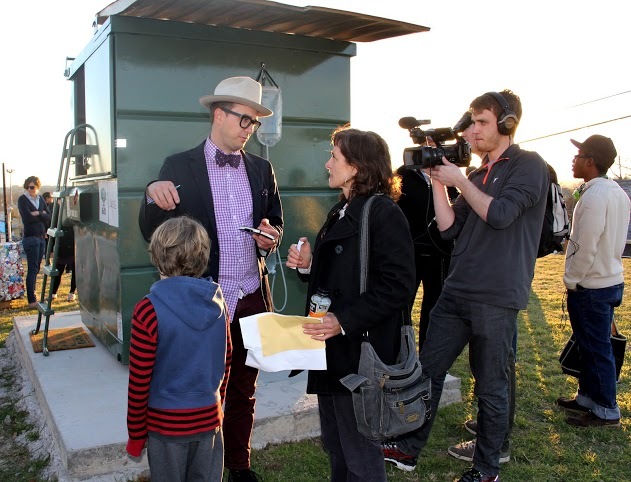 On Feb. 13, Wilson hosted a dumpster warming party for his new abode. Wilson says the project is “not a commentary on affordable housing or homelessness.” "The intent is to see if one can be content in a one percent space," he adds. This “one percent” rule applies to the size, net energy use, water use and waste production of the dumpster home. The dumpster, which is 33 square feet, is one percent of the size of the average American home. Wilson says he and his team will develop climate filtration, climate control and waste reduction technologies to sustain his “one percent” promise. His team consists of design and education experts from around the world, as well as Huston-Tillotson students. The students are part of a campus initiative called Green is the New Black, an organization that focuses on teaching students, from ages six to 16, how to be conscious about the environment. The group's project manager, Angelica Erazo says that Americans correlate wealth with quantity. "We’re trying to teach people that it’s important to be sustainable. We’re basically just being green," she explains. And green looks good on them. In December, the Green is the New Black team won a first place, $75,000 prize at the Ford Foundation HBCU Community Challenge in Detroit for a presentation on the Dumpster Project. Now, the team has turned its focus to the dumpster’s extreme makeover. The Dumpster Project will be completed in three phases. The first phase, what Wilson calls “the camping phase,” began last Tuesday when the dumpster was placed on a concrete square at the edge of the Huston-Tillotson soccer field. 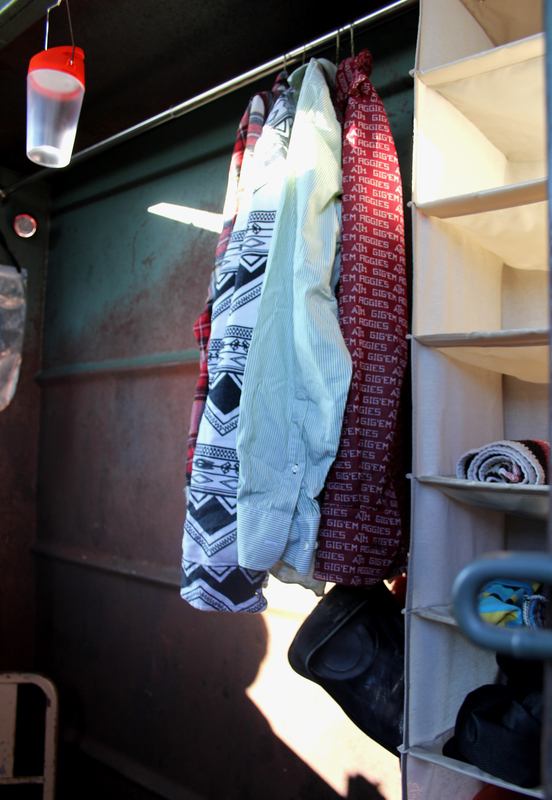 The dumpster now contains a sleeping bag, a chair, a rack for clothes and shoes and a water filter. Wilson and his team of students hauled buckets of water from Lady Bird Lake, about a mile from the university campus, to be filtered and used for drinking and showering. In the second phase, Wilson and his team will add essential appliances like a washing machine, dryer and a water heater. Wilson said he hopes to turn the dumpster, which has an enviable view of downtown Austin, into a completely livable space. “I want to be able to blindfold someone and put them in there so they don't know they're in a dumpster,” Wilson says. At the third “über dumpster” phase, the team will drop the energy and water usage to achieve the “one percent” goal. Wilson, team members and other volunteers will take turns living in the dumpster throughout every phase. “Ideally, the dumpster will be occupied for all 365 days of the project,” Wilson says. 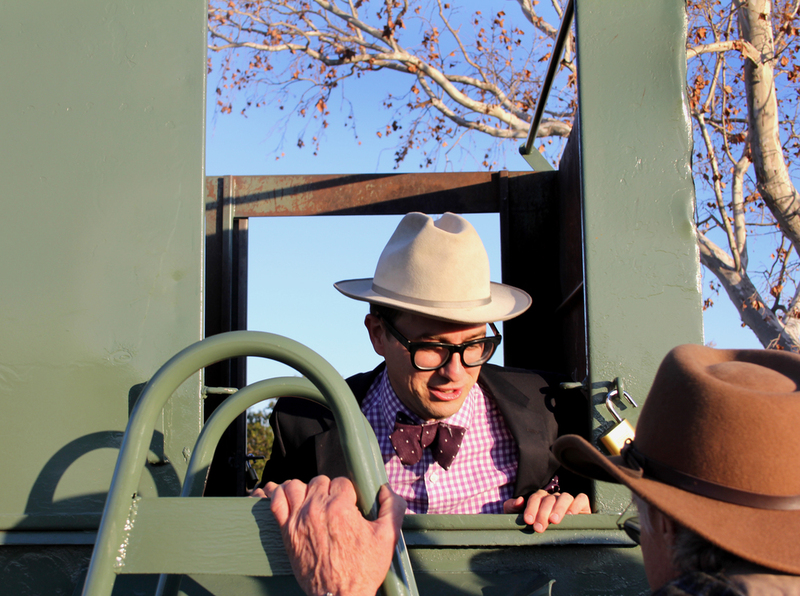 In addition to his unconventional home, Wilson’s vibrant wardrobe, thick-framed glasses and affinity for “trashy” puns all contribute to a persona that is meant to both entertain and educate — almost Bill Nye-esque. Although his home will remain on the Huston-Tillotson campus for now, Wilson says he intends for the dumpster to go mobile and travel around the nation on educational tours. He says his project aims to start a conversation, with children and adults alike, about “living with less."